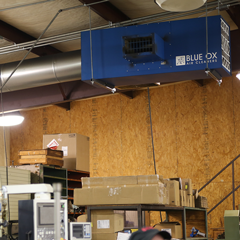 We love our Blue Ox Air Cleaners! We use them in a machining environment, and they have been great for reducing the amount of black particles in the air. 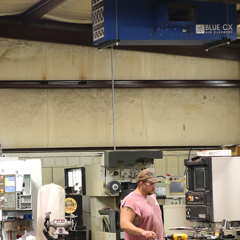 Summary: Spring Creek Machining is a full service 12,000 sq ft machine shop located in Northwest Arkansas. 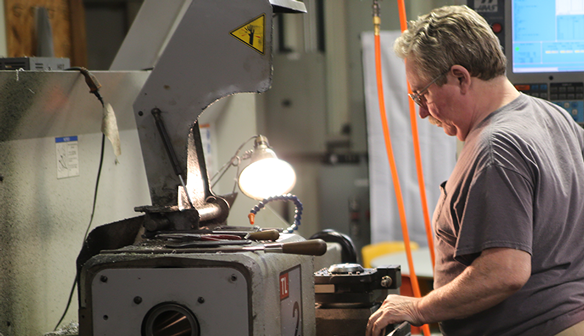 SCCM specializes in machining all types of materials including plastics, steels and nonferrous metals. Their equipment includes CNC Machines, Abrasive Water Jet Machines, Heat Treatment, Welding, Black Oxide, Wire EDM and a vast array of Manual Machining Tools. Challenge: With dozens of machines positioned tightly in the facility, black process dust was constantly being generated and released into the air. Workers quickly began to complain about the conditions in the shop and the dust in the air was a visible issue. 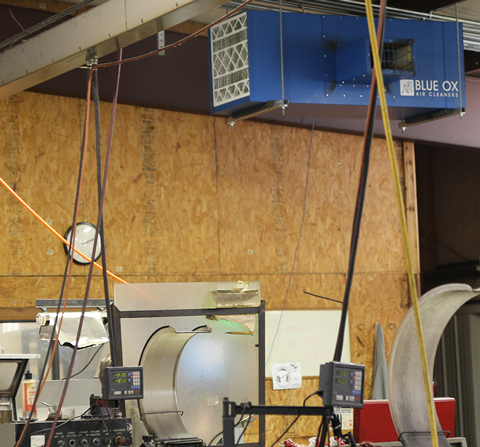 Source capturing the particulate was not an option: retrofitting duct drops to each machine and installing a central dust collection system would be cost prohibitive. Solution:Four OX3500C's (with silencers) were installed above the shop floor. They were positioned to create an airflow pattern which encompassed all of the machines in the shop. With this configuration, particles in the air were reduced dramatically and conditions in the shop greatly improved. We really found this company easy to work with as well as having the knowledge to help us get units that work for our work environment. Summary: Smith Production LLC. owns a 5600 sq. ft. machine shop located in Norwich, New York. They have 5 CNC machines, running 10 - 12 hours a day constantly, cutting hot rolled and cold rolled steel. There is also welding & painting occuring in the shop on a daily basis. Challenge: With so many machines in the shop running constantly & simultaneously, Smith Productions LLC. was having an issue with particulate and fog filling their work space. They wanted a solution that was efficient, cost-effective, and with minimal installation. 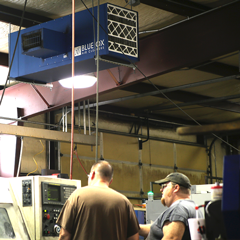 Solution: Similar to Spring Creek Machine Shop, four OX3500C units (with silencers) were installed above the shop floor and positioned to encompass all of the machines in the shop. 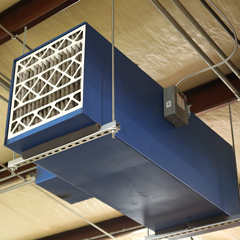 After we installed the OX3500C units, the fog was removed and the particles were greatly reduced. The shop employees immediately noticed a dramatic improvement in the air quality.